No. More. Cheese. Said no one ever? Actually, said me yesterday. I’m in Minnesota visiting my parents and so many wedding vendors right now for two long weeks. That allows me plenty of time to frequent “The Fair” and all my favorite restaurants, indulging in cheese curds, mac and cheese, and cheesy burrito bowls on the reg. The 2 for $4 kale bunches I picked up at Whole Foods have been sitting pretty much untouched in the fridge as I continue to succumb to temptation. However, instead of letting them die a slow, wilted death, I decided to transform today’s recipe, for which I had planned some kind of burrito bowl, into a quirky, but still very much Mexican, kale salad. This salad is far from time consuming, but it’s easiest to throw together with a little planning. It’s great when you want an impressive, indulgent Friday night salad with a glass of rosé or your favorite Mexican beer. For easy assembly, make the vegan sour cream, pickled red onions, and black bean “salsa” in advance. To give you a little behind the scenes action, I did not, as advised, plan ahead for this photo shoot. The pickled red onions you see only had an hour to pickle before I hastily yanked them from the jar to add a splash of color to my salads. If you allow them to work overnight, you’ll get much brighter, even more vibrant, hot pink onions that are crunchy and tangy with no pungent onion flavor at all. 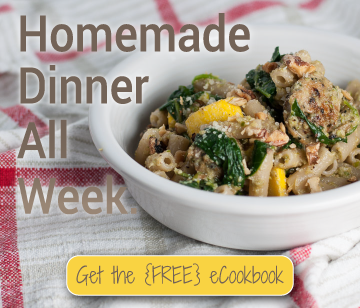 They are my absolute favorite Mexican condiment, and I’ve decided it’s finally time to release them from the privacy of my free eCookbook and shout the recipe from the rooftops. 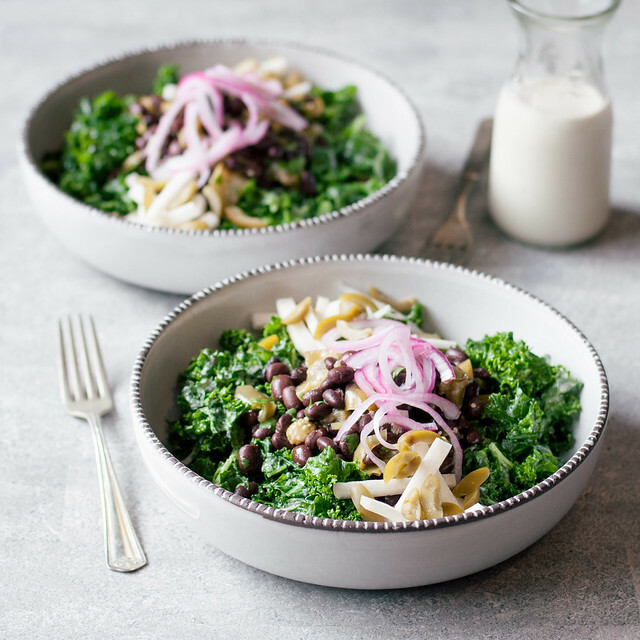 Notice a change in scenery for these kale salads from my usual photo setups? If so, good eye! They were shot on the rather perfect coffee table in the elevator lobby of my parents’ Minnesota condo, with some new dishes and silverware that I acquired while here. It’s been a very inspiring food photography trip, augmented today by day 1 of the Tasty Food Photography workshop, hosted and taught by Pinch of Yum‘s Lindsay. I’m sneaking in the final touches to this post after a long (hot) day filled with food photography, Chipotle, and 15-ish inspiring new food blogger friends. Instead of a class, it really felt more like a fun day with friends who all happen to have the exact same set of common interests. Tomorrow I head back for day 2, so keep watching the blog for fruits of my new knowledge, and Instagram for class updates! If I ordered the perfect kale salad at a Mexican restaurant, this would be it. 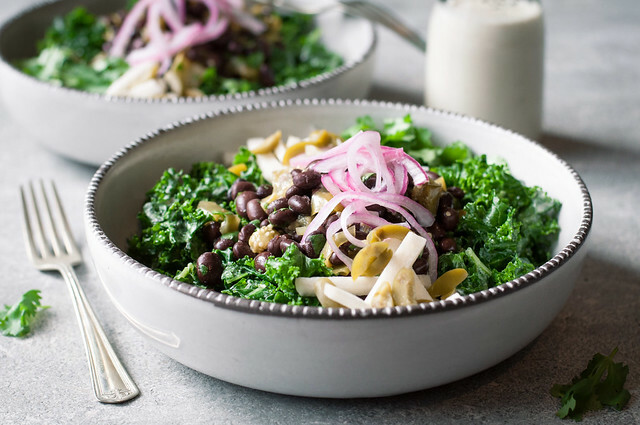 Tender kale, vegan sour cream dressing, pickled red onions, and so much more. Place onion, red pepper flakes, and chile pepper in a glass jar or container. In a large liquid measuring cup or bowl, mix vinegar, water, salt, and sugar until the latter two dissolve. Gently pour liquid over onions until submerged, discarding any extra liquid. Cover and refrigerate 8 to 12 hours to complete pickling, although the onions will be tasty and much less pungent after just an hour or two. Preheat broiler and move over rack close to it. Halve tomatillos (quarter if very large). Splash about ½ tablespoon oil onto a rimmed sheet pan and rub cut tomatillo sides in it to coat. Turn cut side up and broil until browning at edges. Turn halves cut side down and continue broiling until skin is browned and tomatillos are soft. Set aside to cool. 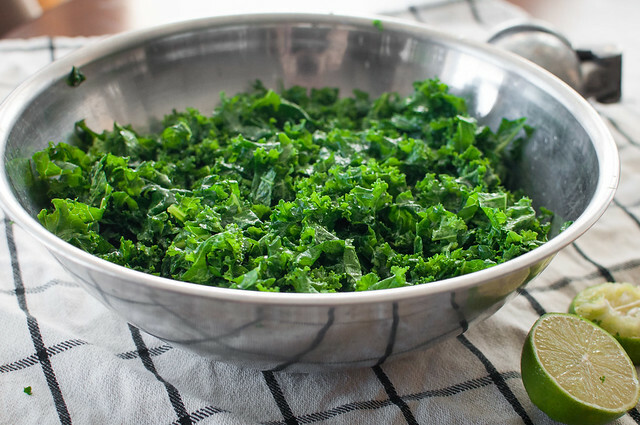 In a large bowl, sprinkle kale with a little salt. 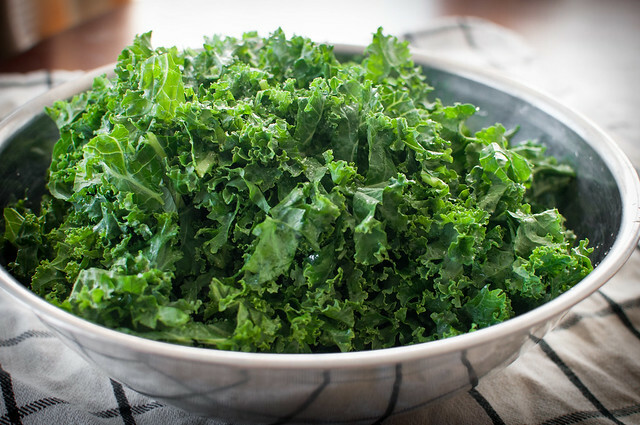 Grab and squeeze big handfuls of kale with your bare (clean) hands, until it becomes greener, tender, and reduced in volume (see pictures). Toss with juice of 1 small lime then let stand at room temp or in refrigerator. 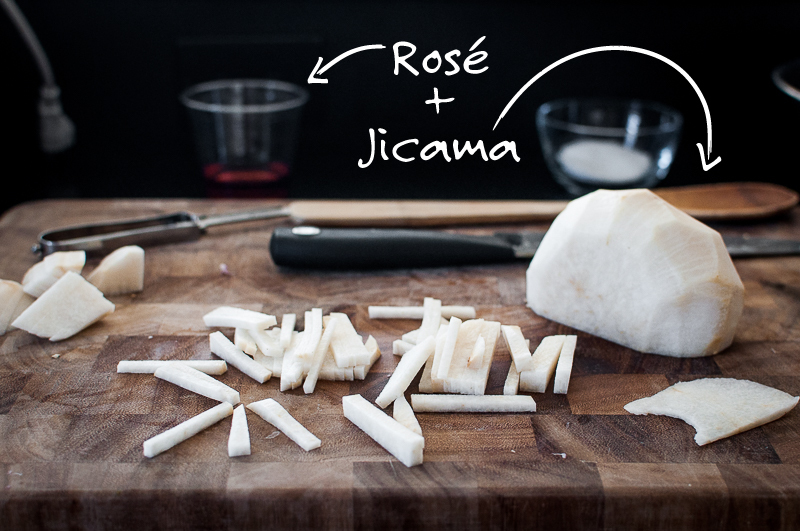 Peel jicama with a knife (the skin is thick), then halve, slice ¼" thick, and julienne. Chop cooled tomatillos and combine with black beans, chopped cilantro, and a pinch of salt to form a chunky black bean salsa. 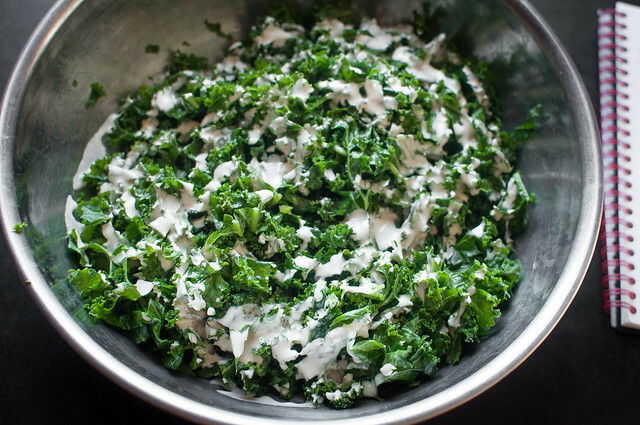 Toss tenderized kale with ⅓ cup, to start, of vegan sour cream to coat (I thinned the sour cream with a splash of water). Add more dressing if desired or serve on the side. 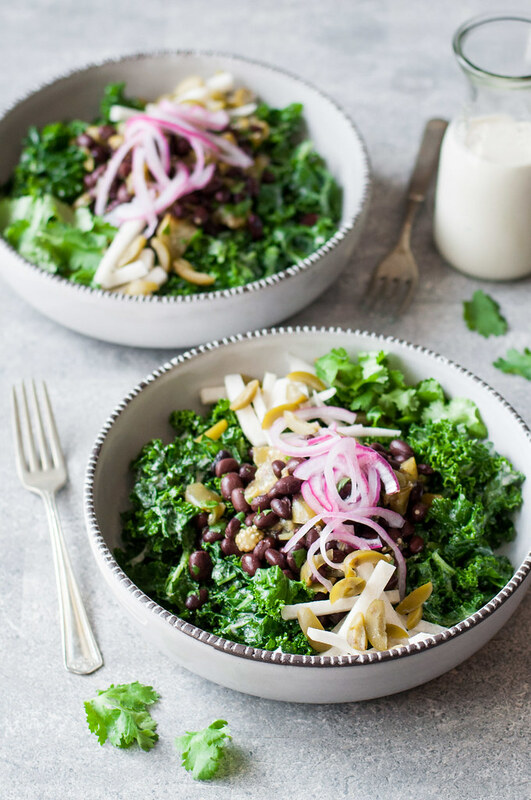 Portion kale between serving bowls and top, or serve family style with, black bean/tomatillo salsa, pickled red onions, jicama, olives, and cilantro leaves. If you need some cheese or nuts, feta and shelled pistachios, respectively, would be nice. 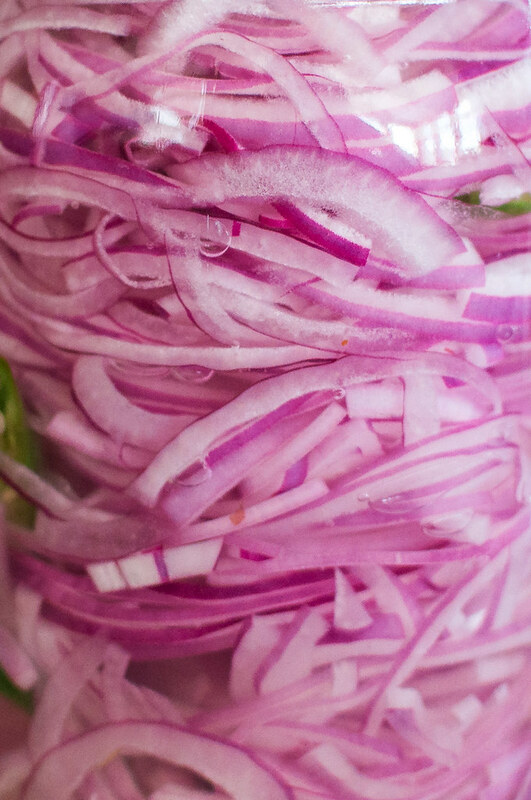 Pickled red onion recipe is a hardly adapted version of my favorite from Bon Appetit, March 2011. Hi Tessa — I just stumbled across your blog and I just wanted to write a quick note to tell you how much I’m loving it! 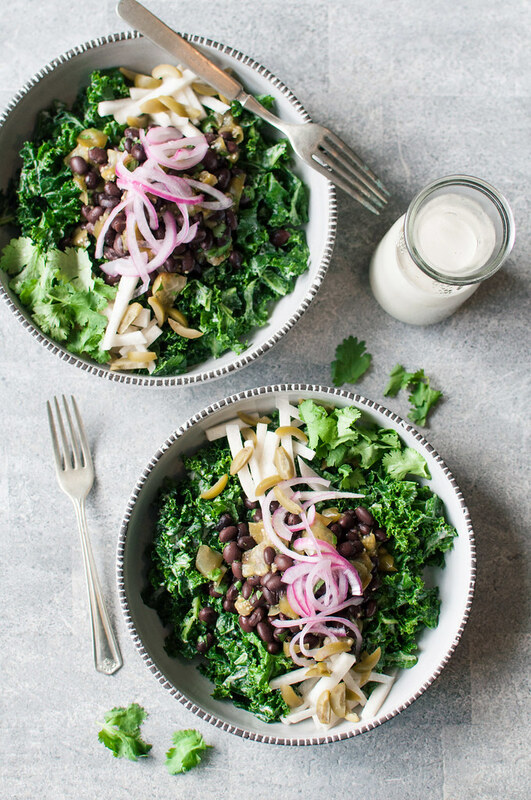 I’m dying to try your vegan sour cream and this salad and your photography is stunning. I’ll definitely be back! This salad has all the yums in it!! Jicama is one of my favorite vegetables so this looks perfect :) Beautiful photos too, by the way!